All is well here! The cats and humans are all doing just fine! I'm amazed Buddy is hanging in there, after the scares he gave us in the fall. He's eating like a horse even after adjusting his thyroid meds. 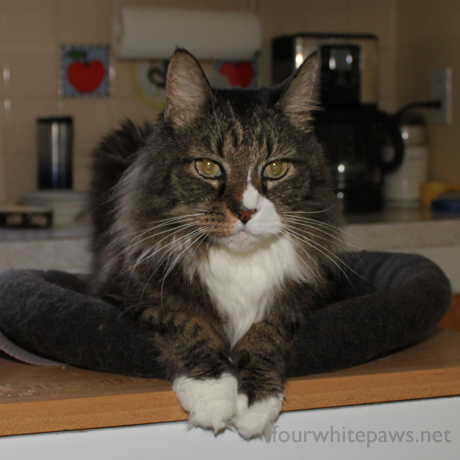 I'm grateful for stable, generally healthy cats! Today would have been Sarah's 47th birthday. I recently attended a local memorial service for her, which was hard but lovely. It was delightful to be in a room full of people who also loved Sarah dearly. Someone put up a bunch of old photos of Sarah through the years. 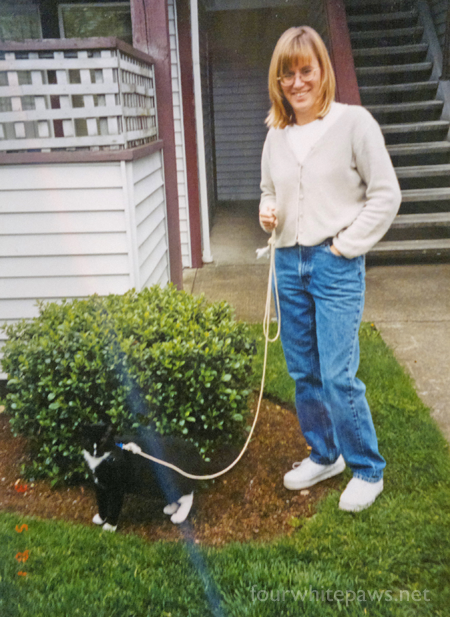 I took of a picture of this picture of Sarah walking Elmo back in the early 2000's, which would be around the time I first got to know her. Elmo was one of the first cats I ever got to know. Elmo loved to go on leashed walks around their apartments! Sadly, Elmo crossed the bridge a few years after this picture. I'm picturing Sarah celebrating her birthday with Elmo, Lucy, Boo boo, and her many other cats that preceded her over the bridge. Happy birthday my dear friend. It's nice to see a post, we're glad all is well with the fur "kids" and with you. We hope your dear friend Sarah IS celebrating her birthday with all her beloved companions who have crossed. Purrs and peace to you. Way to go, Buddy! I'm betting that Sarah is looking down from heaven, sending love back to Earth. Glad to hear Buddy has improved. I like good news. Buddy looks good. It's hard to lose friends! That is great news about Buddy. What a lovely tribute to your friend Sarah. I hope your heart is feeling some relief from her loss. Way to go Buddy, you're doing great pal! Sarah is looking out for all of you. Glad everyone is doing well. Especially Buddy. Great photos, too! And Happy Rainbow Bridge Birthday to Sarah and friends! Your friends are fortunate that you ARE their friend, but you are fortunate as well that they are your friend. Easter is coming. He is Risen. Happy Birthday to your friend in Heaven, I am sure she is reunited with all her kitties. I am glad Buddy is doing well.